Whatever occupies this Craftsman bungalow turned restaurant will become an Eagle Rock favorite. The twinkly patio and front porch alone ensure a steady stream of neighborhood date nights. Despite this, the menu, executed by a Chateau Marmont alum, tries harder than it needs to. The simpler stuff proves the most pleasing: pan-roasted jidori chicken, a perfectly cooked fillet of beef with cipollini, a dreamy combo of burrata and peaches. The more “foodie” dishes—an odd charred cantaloupe and arugula salad, a grainy duck-liver mousse—betray the kitchen’s limits. Homey jarred cheesecake and cobbler hit the right final note. 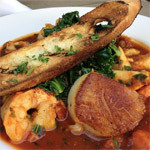 » 1496 Colorado Blvd., 323-341-5899 or littlebeastrestaurant.com.